An unemployed genius (Colman) gets on a quiz show and proceeds to take the sponsor for all he’s worth. A rollicking comedy that never lets up for a minute. I honestly don’t know who could have played these parts better. This film is a masterpiece of casting. Colman manages to make a character who would be despised by most everyone in real life warm and sympathetic. Even his most cutting put-downs are delivered affably and without malice. He wishes to educate, not destroy, and Colman plays it dead-on. Dated and yet timeless. Fluff with depth. A delightful paradox, well worth the price I paid for the DVD. P.S: I bought the DVD based on the strength of the Quotes section of this IMDb listing! 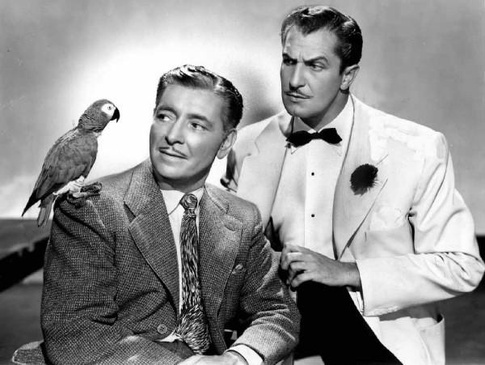 On one level, Champagne for Caesar showcases the comic talent of Vincent Price and Ronald Colman in one of the best screwball comedies to come from the tail end of Hollywood’s golden age. Colman and Price are not two names commonly associated with comedy but as this movie shows they should have been. This movie deserves to be rediscovered by an audience niche who will appreciate it. On a deeper level this movie displays the willful innocence of the Fifties with a tongue-in-cheek manner. The comedy is both of it’s time and mocking the institutions of its time. It is the first movie I know that examines the emerging world of television, crass commercialism and the hypocrisy and hype that it brought with it. You might consider it the grandfather of the Truman Show. A comedy that goes deeper than it first seems. Besides any comedy that uses Mel Blanc as the voice of a parrot is worth looking into. I haven't seen this for years so my mind is a little sketchy on the exact plot but it goes something like this: Beauregard Bottomley (Ronald Colman) a VERY intelligent man goes on a radio quiz show. He keeps answering all the questions correctly and gets more and more money. The show's creator (Vincent Price) wants to stop him. Celeste Holm plays the obligatory love interest. Just great. Who thought Price could do comedy? He's absolutely hilarious on screen. He's clearly having the time of his life and it rubs off on the audience. It basically reaches the point when he appears on screen you start grinning. His reaction when Albert Einstein calls the show to correct an answer to a question is uproarious. Also it has a great, intelligent script with one-liners flying fast and furious. Colman and Holm are good also but it's Prices movie all the way through. Unfortunately this remains virtually unknown. It is on DVD but it's in terrible shape with bad sound and a very worn print. Hopefully it will get a proper restoration someday. Why this movie is not considered up there with the great comedies of the 1950's is beyond me – I mean, Some Like It Hot is funny for two viewings, tops. There are scenes in this movie that never ever fail to make me laugh, and I've seen the film six or seven times by now. All of these are scenes with Vincent Price, who gives what is probably among the top five comedic performances in the history of American film here — at least if you consider those by non-comedians. It's no surprise that Price could go over the top, as he did in all those Roger Corman horror movies, but here, it's expressly for comic effect (rather than camp effect — not the same thing). He was at a transitional point in his career: he was through playing hunky-but-wimpy second male leads and tormented romantic heroes, and was soon to embark on his second career as Mr. Drive-In Horror Movie Star. So this is really his only true comedy performance, and he is brilliant as corporate nutjob Burnbridge Waters. Everybody else here is great*: Ronald Colman is simply perfect as Beauregard Bottomley, an unemployable with a genius range IQ. (I am of the opinion that Alex Trebek wanted to grow up to be Ronald Colman — not necessarily as this character, just in general). Celeste Holm is great as always as temptress Flame O'Neill, hired by Waters to rattle Colman's character to the point where he starts losing on the quiz show. She's very much in the tradition of Carole Lombard: beautiful and a super actress in anything, very adept at comedy and always intensely likable. Barbara Britton as Bottomley's sister Gwenn is another charmer, cute as a bug's ear. *Then there's Art Linkletter: OK, he's great as the quiz show host — he did that for a living in real life. But there's something kinda creepy about him, plus he's no matinée idol, and I always feel a little skeeved at his scenes romancing Barbara Britton. It's taken as gospel that no unattached lead character remain unattached at the end of a movie, but couldn't they have paired her off with one of Waters' employees, a cab driver, ANYBODY? OR could they have hired some second-tier pretty boy to play Linkletter's role? This is my only quibble with the film, and it's why I rate it a 9 rather than a 10.